This card was cased from p. 47. 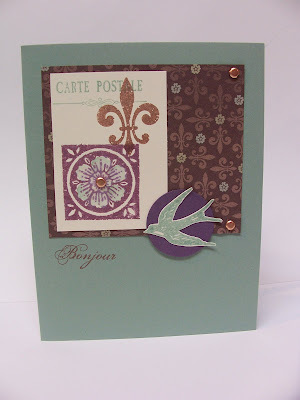 This one took a while to come together, to find a set and paper that would work with the layout. The main image ended up as a collage of sorts, but I don't like that my perfect plum paper doesn't match the perfect plum ink I used on the flower. I think part of it is that the vanilla paper changes the look of the color. This is beautiful, Becky! I love the "collage" look with your main images!